Whilst we were at Ballarat Beat 2018, I decided to grab a few new dresses and this was one of them. Chris actually chose this and bought this for me for Valentine’s Day and it is a really beautiful dress. We got this from Inspired Insanity which is an Aussie vintage seller and I do believe she is from Melbourne. I have met the owner a few times now and she really is such a lovely lady, so I love supporting her. The dress we ended up getting was the Hell Bunny Kullen Dress. The first thing that instantly drew us both to this dress is the amazing pattern. The whole beachy/sailor thing is a little cliche for vintage gals, but honestly, I really don’t care cause it is just so much fun. This pattern has a lot of interesting images on it including lighthouses, knots, boats and other fun quirky designs. The details on this dress are very beautiful and are another interesting feature of this dress that really makes it stand out. Firstly, I absolutely love the tie in the front of the dress; I really think there are a few ways you can wear this feature to make the dress look a little bit more unique each time. 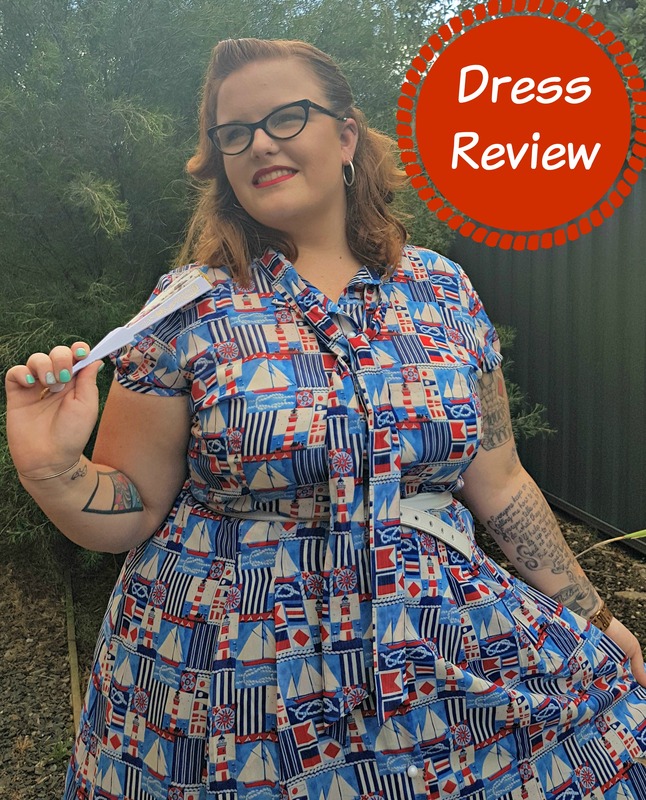 This dress also has cream buttons which are super cute and kind of look like they are pearls from the sea which goes with the nautical theme. The fabric of this dress is 100% polyester and really does feel so amazing. The fabric is completely see through but does come with a cream slip to wear underneath, which I really like. I really enjoy slightly flirty dresses like this where you can see through some areas, but nothing is really showing. I also love the cut of the dress which includes a more modest A-line skirt as well as capped sleeves which I think is super cute and retro. I don’t find this dress to be so intensely vintage that a modern gal couldn’t wear it, but it still has that retro vibe for us Pinup Gals. This dress is probably most definitely a summery dress since the fabric is so breezy, which is really great for Aussie Summers. I was very lucky to get this on sale from Inspired Insanity since we were at Ballarat Beat, however, I do think that the price of this dress is reasonable. On the Hell Bunny website, this dress retails for $60.99USD, which converts to $77.34AUD. On the Inspired Insanity website, she sells this dress for $74.95AUD and offers free shipping on orders over $50 (side note, this is not sponsored, I just want you guys to get the best deal possible if you are interested). $75 is definitely a lot for a dress considering most modern dress can start any from $15+, however, vintage replicas are known to be more expensive. Compared to some brands like PUG, Miss Candyfloss and even Collectif, Hell Bunny is one of the cheaper brands, but the quality is definitely not compromised. Overall, this really is a wonderful dress. I own a few things from Helly Bunny and the quality of these items are really lovely, yet they are a bit cheaper than some other vintage brands. Dressing in retro is definitely not always cheap, but it is nice to find brands like this that sell a good quality dress for less. I really admire all of the details on this dress and found it so lovely to wear on a hot summers day. Disclaimer: I paid for all of these products myself and am not being paid to review these products. All opinions are 100% my own. I think it is vintage fabulous! I would love to have seen two additional photos: one closeup of the buttons and one of the back of the dress. Thank you for a great review!